Treatment or prevention of Vitamin C Deficiency, Scurvy, Infection, Trauma, Burns, Cold exposure, Following surgery, Fever, Stress, Cancer, Methaemoglobinaemia and Children receiving unfortified formulas.Also indicated in Hematuria,Dental Caries, Gum Diseases,Pyorrhea, Acne,Infertility,Atherosclerosis, Fractures,Leg ulcers,Hay fever,Vascular thrombosis prevention, Levodopa toxicity, Arsenic toxicity and etc. One tablet daily with a meal or as directed by physician. Dissolve one tablet in half glass (100 ml) of water and drink instantly. 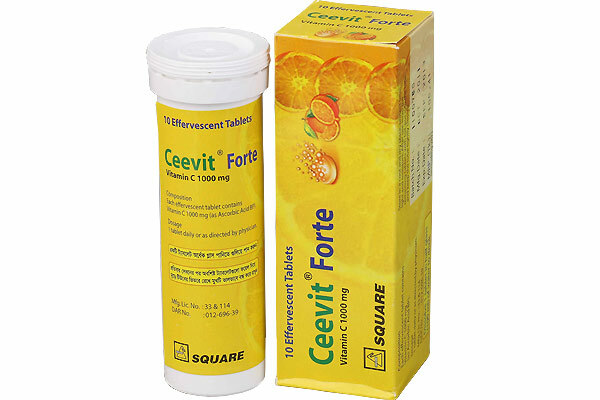 Ceevit® Forte Effervescent Tablet: Each tube contains10 effervescent tablets.